Some vintage Dublin postcards. | Come Here To Me! 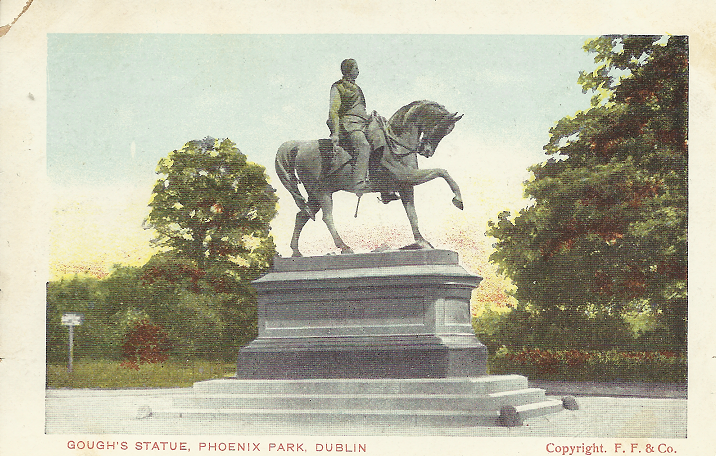 I collect old postcards of Dublin, in particular postcards of the monuments and statues of the city. It’s a cheap and cheerful hobby really, and I’ve accumulated a nice enough collection more for the love of it than anything. They go well with some posts on here, such as the ‘Statues of Dublin’ series, and they’re generally nice to look at. The city has changed in many ways of course and that is always evident. In some cases, they come with scrawled writing on the back and an indication of a former romance or the like. Below are a few favourites from my own collection. 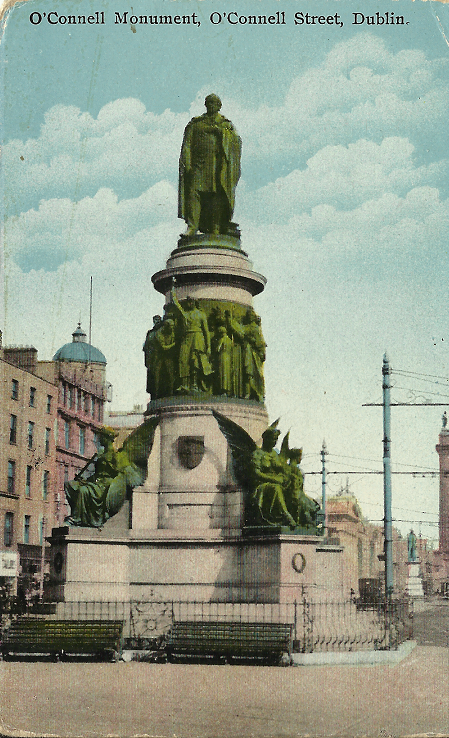 The O’Connell Statue is surely one of the most iconic Dublin images. We featured it rather unusually on the site, by looking at the time it was bombed by Northern Irish loyalists. 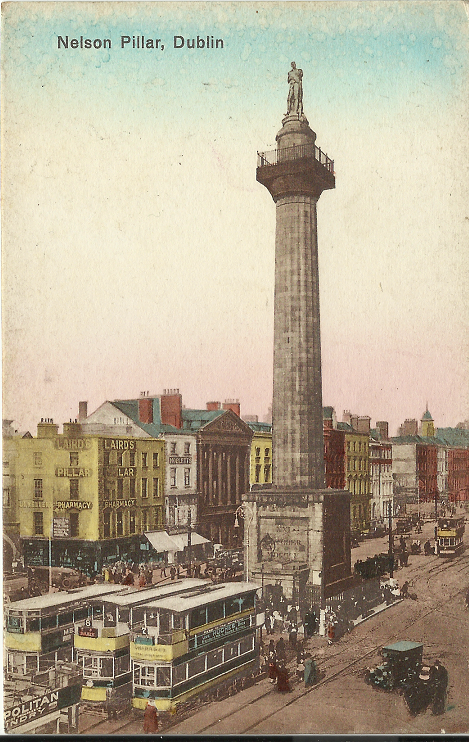 When Nelson’s Pillar was blown up in 1966,its head was stolen from storage by a group of students from the NCAD. It ended up in a London antique shop, under the ownership of Mr. Benny Gray. At one stage it had appeared on stage with The Dubliners at the Gate Theatre. In September of 1966 Gray arrived in Dublin on O’Connell Street atop a lorry, with the much sought after head alongside him. He was also joined, for the hell of it, by The Dubliners folk band. The Dubliners launched into ‘Nelsons Return’, a rewritten version of their popular smash hit ‘Nelsons Farewell’, composed at the time of the explosion. He inquired to a bemused crowd through a megaphone if anyone among them was a trustee of the pillar who could accept the head, a Corporation official came forward. Mr.Gray said it was “lots of fun” having the head in his shop, but the Corporation failed to see the funny side. A spokesperson made it clear the head was not to do anymore travelling. I recently heard Nelson jokingly referred to as Admiral Blownapart. I have yet to get around to the magnificent Wellington Monument, but it will feature on the site in time. I see it every time I go into the city centre. The four bronze plaques around it are magnificent and worth featuring here in their own right. 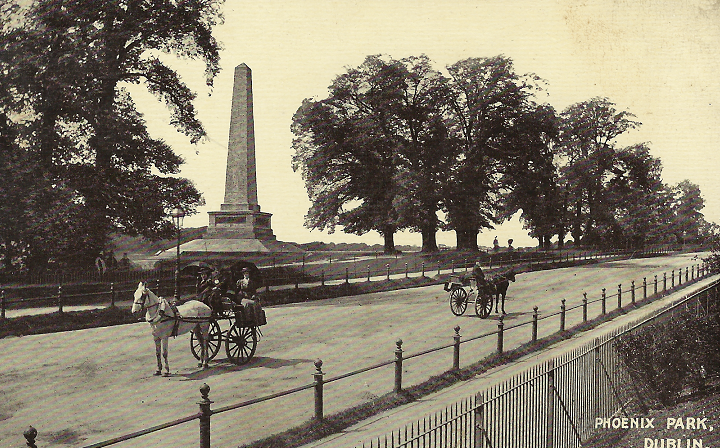 This monument was originally planned for Merrion Square, though unsurprisingly residents objected! Lastly, Saint Stephen’s Green. 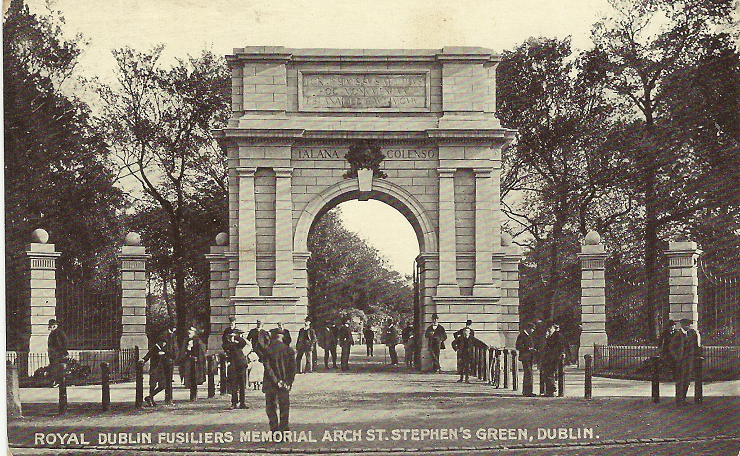 We’ve featured the Green in the past, most recently with jaycarax’s excellent ‘Five things you might not have known about St. Stephen’s Green’. The gate on the Green has another name “TRAITORS GATE”because the names of those on it fought for the British Army in the Boer war. You will note that the Pillar has only the original railings on top. The card predates the caging in of the platform. The tramwires in both that and the O’Connel one are interesting as are the trams themselves in the latter.